It's another rainy day today, which means indoor activities. I spent the morning making two types of pierogi (potato and cheese and pork and cheese), chicken and dumpling soup, and Swedish meatballs. The Swedish meatballs and pierogi are tied in terms of labor intensity, but since they're both tasty I don't mind. 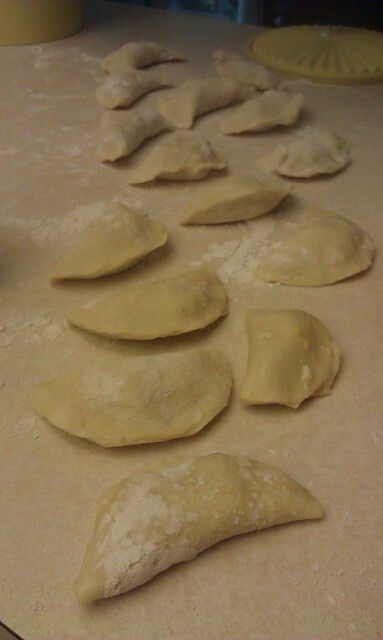 Since Chris also made chili yesterday I ended up tossing 40+ pierogi and the Swedish meatballs into the freezer for later. That just leaves me with tasty soup and him with his chili. The Swedish meatball recipe I use is one out of an old cookbook my mom was kind enough to make a copy of for me. Here's the basics of it. It's supposed to make 70 meatballs, but I usually end up with closer to 40-50 since I don't make them quite small enough. If you're using onions, saute those first until brown in the shortening (or butter if you don't have any). Mix the water and cream together. Soak breadcrumbs in the mixture. combine onion, soaked crumbs, meats and seasoning in a bowl. 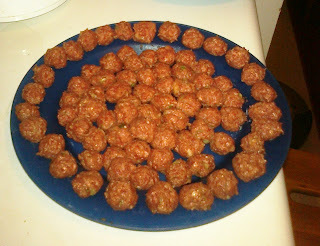 Shape into small balls with your hands (you can wet your hands to prevent meat from sticking). Fry meatballs in butter until browned, shaking pan continuously to keep the balls round. Add boiling water, cover and simmer 5-10 minutes or until tender. I tried to take a photo of the latest batch but they're frozen and um...yeah. So i just grabbed an old snapshot. Hope that helps! You can always cut down on the amount of butter. I dont always use that much and they're fine.